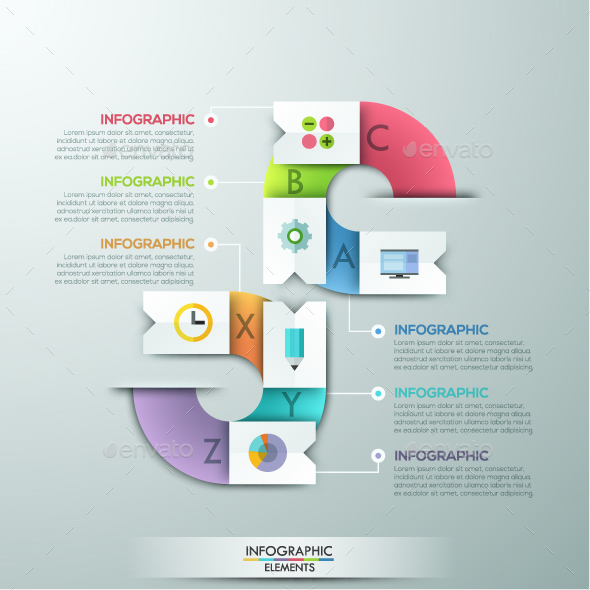 Modern infographics options banner with 6 paper ribbons and flat icons on bright background. Vector. Can be used for web design and workflow layout. Layered: Yes; Elements Included: Icons; Graphics Files Included: Photoshop PSD, JPG Image, Vector EPS, AI Illustrator; Minimum Adobe CS Version: CS2. 100 Outline Icons (Pixel Perfect); Modern Infographic Choice Templates (3 Items); Business Tree Timeline Infographics; Modern Infographic Circle Timeline; Modern Vertical Infographic Timeline; Abstract Infographic Process Template; Modern Infographic Choice Template (2 Colors). Keywords: 3d, abstract, advertising, banner, business, choice, circle, concept, creative, entertainment, geometric, icon, infographic, information, internet, layout, modern, options, paper, presentation, process, project, ribbon, round, stationery, step, template, vector, web page.